Our integration with GivingFire provides automatic real-time synchronization of GivingFire transactions with your TouchPoint database. Additionally, you can (optionally) sync all your historical giving data in GivingFire to your TouchPoint database. If you do not already have an account with GivingFire, you will need to establish one at https://www.givingfire.com. To link your GivingFire account to your TouchPoint database, you will need to create a special user account with appropriate roles and then configure a few settings in your GivingFire account. Add APIOnly role. Go to Administration > Lookup Codes and, from the Miscellaneous panel, select Roles. If it is not already in your database, add the role APIOnly. Add a Person. Add a new Person record, giving it the name GivingFire User. You can leave address and all other details blank. After creating the record, go to its System tab, User Account sub-tab, and click on the Add User button. Give the account the user name of givingfire and the role APIOnly . You will now need to contact TouchPoint Support, requesting that the Developer role also be added to the new givingfire account. Configure Your GivingFire Account. Go to your GivingFire Dashboard and, under Settings > Data Services > 3rd Party Integrations, click on the Configure TouchPoint button. TouchPoint Site URL: This is the full URL for your TouchPoint database. For example, for Bellevue church, the site URL is https://bellevue.tpsdb.com . You should replace bellevue with your church’s sub-domain. Username & Password: Enter the username ( givingfire ) and password of the acccount you created in Step 2. This account must have the APIOnly and Developer roles. Email Integration Errors: Enter an email address that should receive notifications of errors with the GivingFire sync to TouchPoint. If errors occur, a notice will be sent to this email address along with any steps that should be taken to resolve the problem. Integration Status: Select Enabled to turn on the sync. When enabled, GivingFire will sync all transaction data to TouchPoint as soon as it is created and approved in GivingFire. When you have entered all the settings, press Save to start. GivingFire will test the API connection to ensure the settings are correct. If so, you’re all set! Setting the Integraton Status to Enabled will not automatically sync past transactions to your TouchPoint database - only transactions going forward. If you would like to sync past transactions, see below in the section Syncing Past GivingFire Transactions. Once you have set up your GivingFire-to-TouchPoint integration, GivingFire will automatically sync your data in the background. 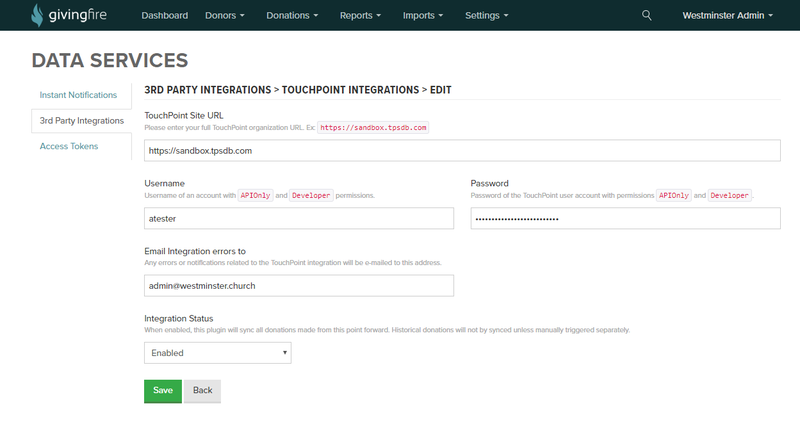 After you successfully save your integration settings, you’ll be redirected to the TouchPoint details page. You can return to this page at any time by going to Settings > Data Services > 3rd Party Integrations > TouchPoint. This page will show the number of synced records and other details of your integration. You can also Disable your integration to stop real-time syncing but keep your setting intact, or Delete your integration to stop syncing and purge your TouchPoint settings from GivingFire. If you have questions or would like help setting up your integration on your GivingFire dashboard, you can contact your GivingFire account manager or open a support ticket with GivingFire at support@givingfire.com. And, of course, if you need help setting up the account on your TouchPoint database, you can submit a support request with us. 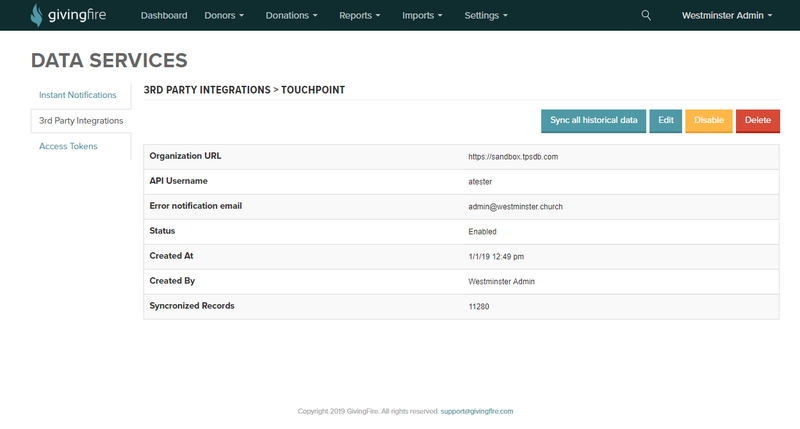 If you would like to sync your historical GivingFire transactions to TouchPoint (i.e., past transactions made before you set up the integration, you can do so pressing the Sync all historical data button on the Details page. GivingFire will attempt to sync your entire contribution data with TouchPoint. GivingFire keeps track of what donations have been previously synced with TouchPoint, so there is no danger of duplicate transactions, even if you press this button more than once or if you need to sync transactions made while your TouchPoint integration was temporarily disabled.